Going Unplugged – Yes or No? Going Unplugged - Yes or No? Plugged or unplugged... Now there is a lot that can be said about subject. We are by nature, creatures of habit and technology has certainly become centerfold in our lives. Our phones are pretty much appendages to our hands and many have become social media mavens. You have heard the saying “sharing is caring” right? 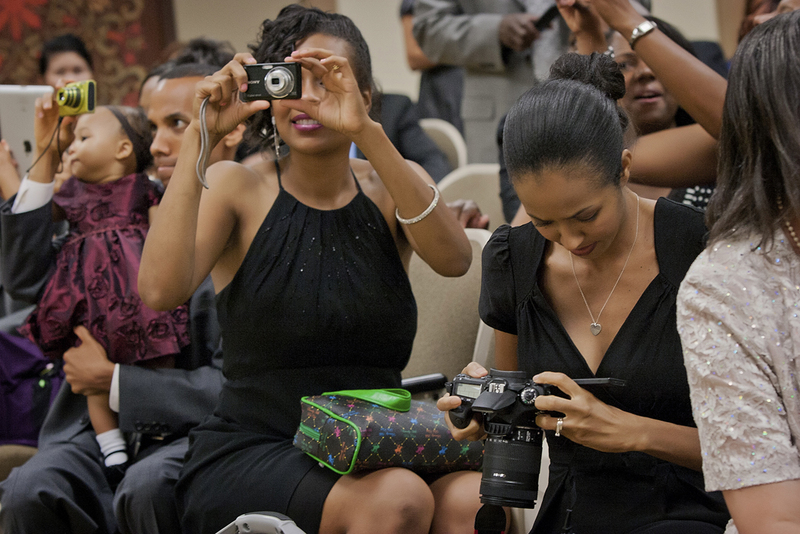 However sometimes some guests at a wedding often go a little overboard, getting in the way of the official photographer or videographers shots. Really it’s not a competition with the photographer to get the best shot, respectfully it is the couples very special, hopefully, one and only day. Our photographic team has seen a lot when it comes to weddings. I absolutely love the idea that people can share their images from the wedding day. Perspectives are unique as the individuals involved. Variety makes life colorful! Many are making customized hashtags for Instagram posts or specialty geofilters for Snapchat! I think it builds the excitement of the day, perhaps even for friends and family that couldn’t make it to the wedding. On another note, some couples have decided that it might be best if their guests were able to enjoy the complete experience of their wedding day without having to pull out their cameras, iPads or phones. Sometimes well meaning friends and family can certainly do more harm then good. I have experienced guest’s walking right in front of the photographer put their camera or cell phone right in front of the photographer’s camera to snap a photo. At times guest’s flashes will go off at the same time that the wedding photographers flashes are triggered and a planned for precious moment ends up as an overexposed image. I have seen even the couple's solo wedding dance ruined by well meaning individuals. On one occasion, while the couple was all alone on the dance floor, in a sweet tender moment of their first dance; a guest walked right up to them and shoved a camera in their face and said “say cheese”. Talk about ruining the moment for the couple and not to mention the photographer’s images. Oh boy, now the photographer will have to change his open dancing view of the couple to exclusive zoomed in tight crops just to cut out the guest in the images. There are many such scenarios that do occur especially if your guests are so caught up in the moment that they forget there is photographer behind them. Many brides and grooms are making a conscious but kind request to the guests to hold back from taking photographs at their wedding. This trend is starting to be called an “unplugged” wedding. Here is the Google definition: An unplugged wedding is when you ask your family, friends and guest to turn off their phones, ipads, cameras and other digital distractions during the ceremony and/or reception. Of course anything can happen at a wedding. I am just writing this so anyone planning a wedding can be informed and ask themselves, should we have an unplugged wedding or not? It certainly is up to the couple. Or hopefully this will help guests to think more about proper decorum, etiquette and how their actions could affect the bride and grooms final product and images. Bottom line is that it is hard to capture precious wedding memories if you have to dodge guests who keep following you for the same shots. Love to hear your thoughts in the comments below.